Introducing Dave Brimleys "Race-Prepped Trail TJ"! RME- What is the story behind your rig? Dave- I bought it as a junior in high school. My family has been wheelin' for years. And the bug bit me as a wee lad. It was a bone stock TJ with a smiling front axle from a largish 10' high jump the previous owner "accidentally" hit. Once on accident. Twice on purpose for the cool picture. A three week thrash build to get it ready for the family Moab trip ensued. I made it. But wasn't with out problems. From then on I was hooked. RME was the only website I came too. I watched Greg's RME TJ take shape (I think I donated the rear springs to the cause) as well as Ben and Kami's TJ and Spidey's YJ. All were total dream rigs for me. Slowly I built my rig into a capable wheeler. Then I met Casey Beach... and well it was all downhill from there. Wheelin' with that crowd requires guts and equipment. I needed more of both. I had a plan of what I wanted and with Casey's help, made it a reality. 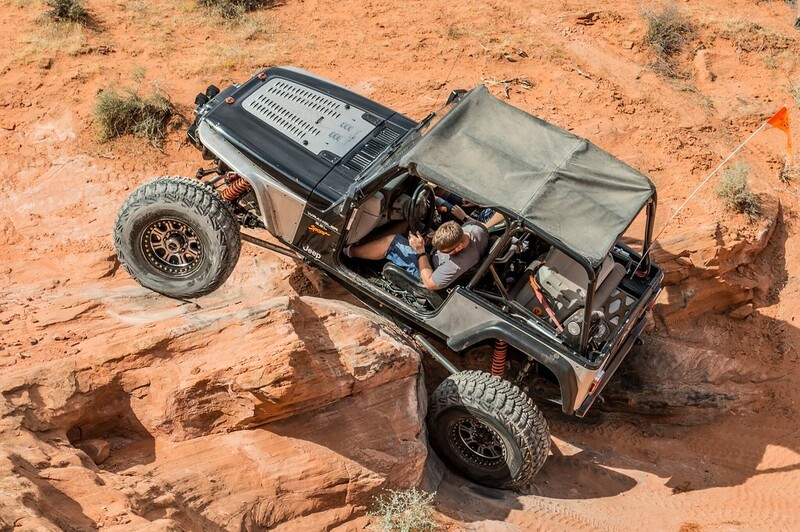 This definitely wasn't the standard way or cheapest way to build a TJ. But it is totally unique and can hang in the nasty stuff. RME- Why did you choose this particular model as a base for building your rig? RME- What is/was the goal behind building your rig, and have you met the goal? 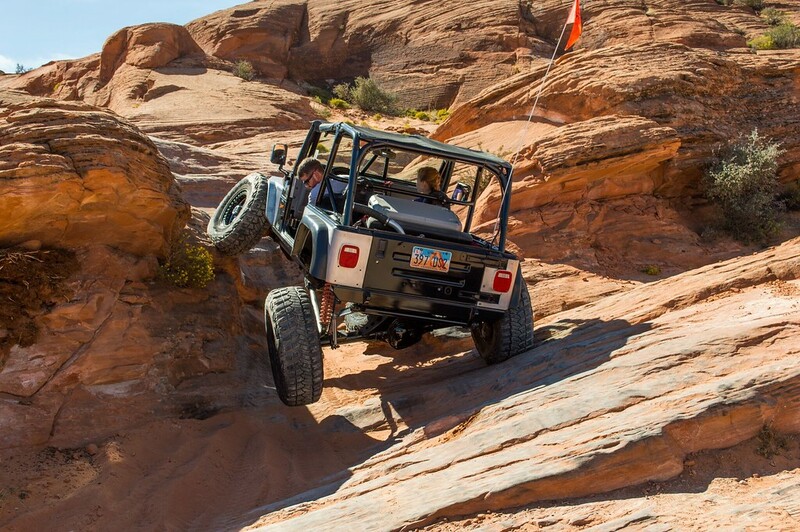 Dave- The goal has always been to have a fun rig to wheel with my family and friends. And keep pushing the limits of what I'm comfortable and capable of doing. As it sits now, I can drive it to work, mob through the whoops, jump it at the dunes and rock crawl. It isn't the best at any of them. But it is a solid all around rig that still has heated seats, a windshield with wipers and a heater. Plus it sounds cool. RME- If you had to do it all over again, would you do anything different? RME- What is your favorite feature of your rig? RME- What is your favorite trail? Dave- I love Pritchett and really enjoyed Upper Helldorado. But I have really been digging Sand Hollow lately. I'd love to get out and explore some of what Colorado has to offer and do the Rubicon too. RME- What kind of influence has this vehicle had on your lifestyle? Transmission- $100 4L80e out of a clapped out 1991 suburban...it may have 185k miles on it. And I may have just installed it and hoped it worked...and it did! Axles- Custom front TeraFlex CRD 60. My brother and I bored the housing to accept 3.5" tubing. Reid inners and outers with their bronze king pin bushings. Custom sheet metal fabricated steering arm for the drag link. 4.56 gears transfer the torque out to the wheels via a Yukon Zip locker and 4340 Yukon shafts and super joints. The rear axle is a Dana 60 out of a '99 Ford E-350 super duty van. Paid $45 on a half of day at the junk yard. 3.5" tubes, smooth bottom center casting, factory twin piston disc brakes and large spindles are what make this axle a junk yard gem. I stuffed it with 4.56 gears, Zip locker and 35 spline chromos from Yukon. 3 link front with pan hard. 14" Fox 2.0 Coilovers. 16.5" of useable wheel travel. Single triangulated 4 link rear, 14" Fox 2.0 coilovers, 15" useable wheel travel. 2" 7075 links using summit machine flex joints. Steering- 1.75" 7075 tie rod, 1 ton chev tie rod ends. Scout II steering gear, ported with some extra goodies inside. Howe TC pump and 1.75" ram mounted to the tie rod with a ridiculously overbuilt clamp made from 3" solid bar. Coleman 1.5:1 steering quickener, taking the Corn Husker box from a 4.25 turn box to just over 2.5 after the box was timed to the ram and stops on the axle. This has worked pretty good....but I think there are improvements to be had. Protection- 2" DOM roll cage, Brimley Built "Rock Toboggan" full length skid - motor to t-case. Big. Heavy. Slippery. Boat sides. Mildly terrifying to install, but worth it. Bumpers- "Slightly" modified Poison Spyder rear corners and Front high fenders. Both aluminum. Other Interesting Facts- List of parts left from original Jeep purchase in '07: ~5' of the frame; the tub, minus most of the floor; dash; hvac; steering column; gauges; windshield squirter pump; front skin of the grille. 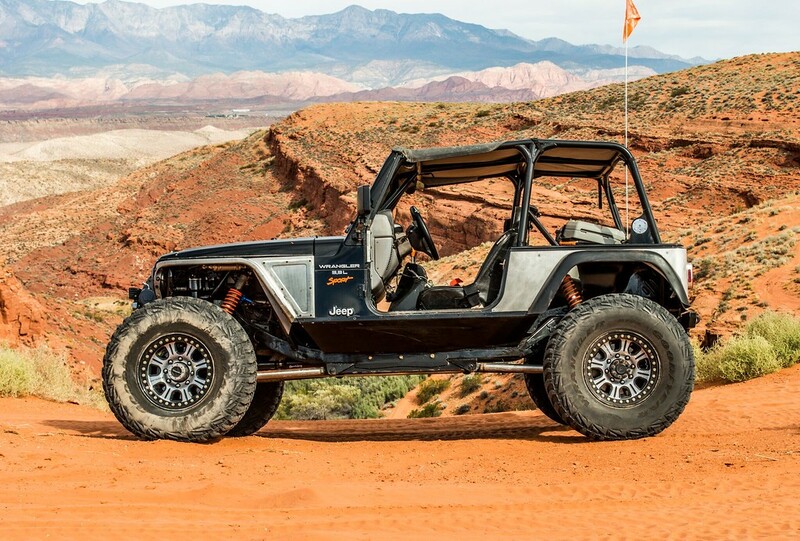 This Jeep is about as custom as it comes. Almost everything on it has been modified in some way to suit a purpose. And if it didn't exist, I designed it and built it. Everything was done for a purpose. It was built as a "race prepped trail rig". I don't ever plan on racing it. But following that mantra has proven to be very successful. I have had a couple very small issues. Surprising considering the magnitude of build. The thing just flat out works. Yep, if I ever build another rig, it'll probably be very similar to this. Nice job on it. This is seriously one of the best executed TJ builds that I've ever seen, very well done Dave and congrats on the feature! Love this rig. I really need to get a closer look at your suspension. Looks really clean. 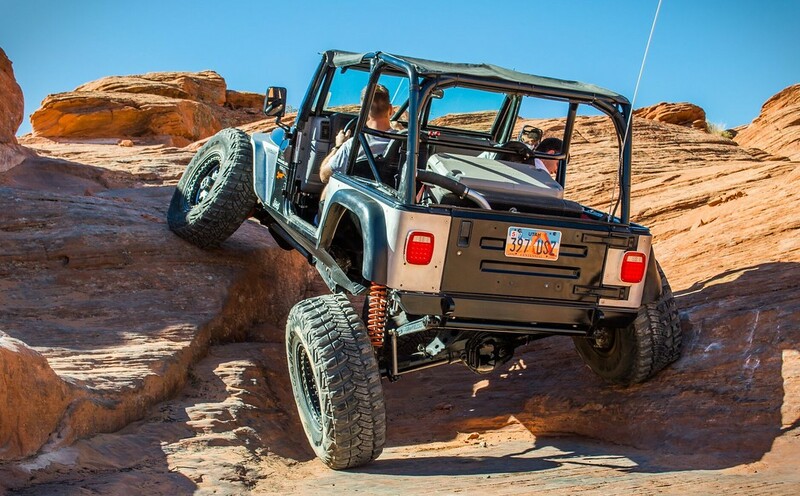 I love this jeep and I love featured rigs! We need more of this. This turned out so sweet. Nice job! Thanks! You're welcome to look anytime! Awesome all-around rig. Is there a build thread on it? Love this Jeep. Great write up RME! One of my favorite TJs. I have had one majorish issue crop up. I lost the rear pinion gear. Looks like the failure was spalling. Probably from running slightly low on oil when my broken off breather let a bunch out when I was sideways in the soup bowl at the end of the Maze. Bummer, but oh well. Time to regear to 5.38s. Going to try some tricks with these gears to see if I can make them survive and be reliable for years to come. Coming down the pipeline....I bought a 6.0 a little over 5 years ago....It's getting high time to get that built and swapped in. It will have L92 heads, a pretty healthy cam and headers with larger primaries. Should make close to 500 hp. The 4L80 will be coming out at the same time in favor of a 6L90. Should make for some fun. Love the 40's, are those Creepy Crawlers? I thought you were running Razr's? The built 6.0 and 6L90E are really going to change that thing in a huge way! Nice update. I'm a huge fan of this jeep. Glad you're still wheeling it a lot. Yes. haha. I have both. Well. Found some limitations. As it turns out, cracked welds can turn into catastrophic failure. When I had the front end apart to regear it I noticed a minuscule crack in my front upper control arm bracket. Not alarming. Not surprising considering how much I’ve flogged this Jeep in the last 3 years. I put it on my list to fix before my spring sand hollow trip. After I broke my gears in, I made a quick snow bashing run up in the hills above 5 mile to attempt to get to the Mercur mine overlook. Got up into super deep snow. Then catastrophe hit. One thing to note, my front suspension has always had an affinity for wheel hop. Plain and simple. Too much anti-dive built into the geometry. It was partially a compromise for packaging. Deep snow+wheel hop+cracked weld=sad face. The bracket almost completely tore off the axle and the pinion dove for the ground. The driver side shock shaft snapped and the passenger bent both the shaft and the eyelet. Creative ratchet strapping and winch tension allowed us to cobble it together well enough to get off the mountain....at 2 mph. Got it home. And just got it back on the road. Only 2 weeks down and I had a Disneyland trip (first time. it isn't the happiest place on earth) in the middle. Since I couldn’t maintain uptravel by adding more separation at the frame without putting a bend in my upper control arm to decrease the antidive, I added some adjustability into my new axle bracket. The old bracket didnt have sufficient weld surface area with the axle tube. So I changed that with the new bracket. I decided to start with a big change and moved my arm to the bottom hole. Hoping the wheel hop is gone. It decreased axle separation by 2 1/8” from the old bracket (which the top hole mimics). I wanted to maintain what it used to be since it did work well aside from the wheel hop. I had Matt at Desert Speed Shock Tuning service all 4 shocks, since they were due. Everything was still in good shape. Only needed a couple seals (in addition to replacing the damaged shafts). He also installed some progressive "snubbers" on the shafts to help more with bottoming control. Can't wait to try them out. Also dropped the ride height just over an inch when I reinstalled the shocks last night. Still have almost 7" of uptravel in the front and a little over 6" in the rear. Should still mob quite nicely. 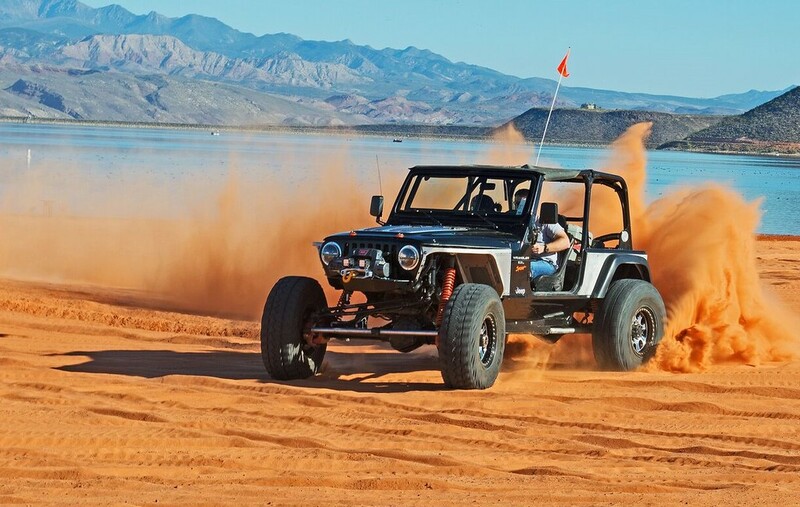 Hoping to get the new motor and trans installed by summer time after returning from Sand Hollow at the end of the month. Pretty crazy & impressive breakage! Nice work on beefing up the new mount that much more, looks way strong. Makes me think about how my link mounts are going to look on my Willys Crawler build! 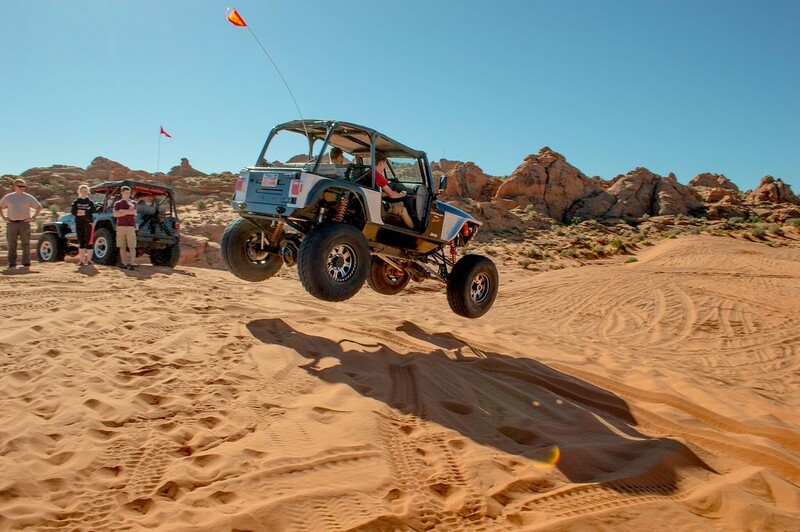 Years ago at a UROC event in St George, I was checking out a FTM buggy that Parker Garret built & was driving and noticed a crack on a front upper link mount. I showed Parker and they were able to get it welded up and reinforced before their next run. IIRC, they also had a 3 link so failure would have been catastrophic. Funny, when I was building this, Bentley Garner helped me do the floor out at Mitch Sweatt's shop. Parker was renting space from him, so I saw Parker a lot 6 or 8 months before he passed. He said the same thing about 3 links. Make sure that mount is beefy. It was adequate, but I'm hoping this go around is permanent and won't suffer the same fatigue. Should be that much better if I'm able to correct the geometry to the point it doesn't hop any more either.